modified from McLemore, V., and Dunbar, N., 2000, Rockhound State Park and Spring Canyon Recreation Area: New Mexico Geology, v. 22, no. 3, p. 66-71, 86. Figure 1 – Location of Rockhound State Park. Rockhound State Park lies in the Little Florida Mountains southeast of Deming, New Mexico (Fig. 1). It was established in 1966 as the first park in the United States that allowed collecting of rocks and minerals for personal use. Each visitor is allowed to collect as much as 15 lb of rocks and minerals from the 1,100-acre park; mineral dealers are not allowed to collect for sale. Rockhound State Park actually consists of two separate units, the main park and Spring Canyon Recreation Area (Fig. 1). Spring Canyon lies in the northern Florida Mountains, south of the main park, and is open for day use only from Easter through November. The main park provides excellent views of the surrounding mountain desert. Basin and Range topography is easily seen in the distance. On a clear day the smokestacks of the Hurley smelter can be seen to the northwest. The Cobre Mountains form the far northern horizon behind the smokestacks. The Burro Mountains lie to the west-northwest; the Victorio Mountains lie to the west-southwest. The Florida Mountains lie directly to the south of the main state park; Florida Gap separates the two ranges. The Cedar Mountains lie to the south-southwest. The dark mountain north of Deming is called Black Mountain. Spring Canyon in the Florida Mountains is a sheltered canyon and offers solitude common to many canyons throughout the desert Southwest. The Florida and Little Florida Mountains are typical of the mountain desert throughout southern New Mexico and Arizona. Elevations range from 4,400 ft along the foothills, where the state park is located, to 7,448 ft at Florida Peak in the Florida Mountains. Water is scarce and limited to wells and hidden springs, but be careful of thunderstorms and flash floods during the summer months! Despite the dry, seemingly inhospitable environment, life abounds. The area is home to many lizards and snakes, deer, antelope, coyotes, and small mammals such as prairie dogs, rabbits, badgers, and many birds. Mountain lion and desert bighorn sheep may be seen at the higher elevations of the Florida Mountains. A variety of plants thrive in this environment, including yucca, prickly pear cactus, barrel cactus, ocotillo, creosote bush, mesquite, and hackberry; juniper and scrub oak are common in the canyons. Figure 2 – Geologic map of the Little Florida Mountains, including Rockhound State Park (simplified from Clemons, 1982). Paleozoic through lower Tertiary sedimentary rocks overlie a Cambrian granitic to syenitic pluton in the northern Florida Mountains (Clemons and Brown, 1983; Clemons, 1984, 1998). The rocks at Spring Canyon Recreation Area belong to the Starvation Draw Member of the Rubio Peak Formation and were emplaced about 51–36 m.y. ago (late Eocene to early Oligocene, Clemons, 1982). The Starvation Draw Member consists of volcanic breccias, conglomerates, and lavas of andesitic composition. A rhyolite dike, which cuts the Starvation Draw Member near the head of Spring Canyon, is 25.4 m.y. old (groundmass, 40Ar/39Ar; unpublished age determination, New Mexico Geochronology Research Laboratory, New Mexico Institute of Mining and Technology). The Little Florida Mountains consist predominantly of interbedded mid-Tertiary andesitic, dacitic, and rhyolitic ash-flow tuffs and lavas, and volcanic-derived fanglomerates intruded by rhyolite domes and dikes (Fig. 2; Clemons, 1982, 1984, 1998). The earliest evidence of volcanic activity in the Little Florida Mountains are small outcrops of ash-flow tuffs exposed approximately 1 mile north of the state park (Fig. 2) and farther north, near Little Gap. Altered sanidine and biotite from an ash flow near the base of the stratigraphic section at Little Gap give 40Ar/39Ar ages of 33.5 m.y. and 32.9 m.y., respectively. This ash flow may correlate with the 33.5 m.y. old Oak Creek Tuff that erupted from the Juniper caldera in the northern Animas Range in the Boot Heel volcanic field in Hidalgo County to the west. During ash-flow eruptions, volcanic ash can travel a great distance from the source vent. In some cases, the ash is still very hot when deposited and can then fuse, or weld, into a very dense, hard layer of rock, such as the ash-flow tuff found in the Little Florida Mountains. The ash-flow tuff is overlain by andesite flows (andesite of Little Florida Mountains) that were probably erupted from shield or stratovolcanoes. The vents of these once-prominent volcanoes are difficult to impossible to find because of local faulting and rapid erosion. The andesites subsequently were intruded by rhyolite domes and covered by rhyolite lavas and tuffs (Fig 2; rhyolite tuff [Tlt] and rhyolite [Tlr] of Little Florida Mountains; Clemons, 1982). Volcanic activity was relatively brief in geologic time; rhyolite and andesite samples from the state park range in age from 28.5 to 24.4 m.y. (40Ar/39Ar; unpublished age determination, New Mexico Geochronology Research Laboratory, New Mexico Institute of Mining and Technology). Seismic data suggest that there are only 600 ft of volcanic rock in the subsurface in the area of the state park. Erosion of the volcanic rocks began during and after eruption. The fanglomerate of Little Florida Mountains was the first of the deposits that formed by erosion of the volcanic rocks and is Miocene in age (Clemons, 1982; Kiely and James, 1988). Dacite flows were erupted onto the fanglomerate of Little Florida Mountains. During and after this brief period of volcanic activity, regional tectonics (i.e. mountain building by block faulting) related to the Rio Grande rift uplifted the Little Florida and Florida Mountains; erosion has since worn the mountains down to their present elevation above the surrounding desert. Wind, water, and ice have continued to break up the rocks through time and to carry fragments downslope forming the gently sloping bajadas or alluvial fans at the base of the mountains. The campground at Rockhound lies on one of these bajadas. Geothermal ground waters and springs were associated with the volcanic activity. Silica cementation of the younger fanglomerate of Little Florida Mountains indicates that these fluids continued to circulate long after eruption of the volcanic rocks and during their erosion (Kiely and James, 1988). Manganese-oxide and fluorite veins that cut the fanglomerate of Little Florida Mountains in the northeastern part of the Little Florida Mountains were also formed during this time. These deposits are present where various manganese- and iron-oxide minerals, along with fluorite, barite, calcite, and quartz, are found in the fanglomerate of Little Florida Mountains (Lasky, 1940; Clemons, 1982; Kiely and James, 1988). Hydrothermal fluids that contained high concentrations of manganese and fluorite, along with silica, also formed these mineral deposits. The Manganese mine was one of the larger producing mines in the district. The mines are extremely unsafe, and visitors should not enter the adits. Care is needed around the shafts and prospect pits as well. Fluorite production from epithermal fluorite veins is estimated as 13,428 short tons, mostly from the Spar mine (McAnulty, 1978). Manganese production from epithermal manganese veins is reported as 19,527 long tons of ore and 21,393 long tons of concentrate (Farnham, 1961; McLemore et al., 1996). Production of manganese ceased in 1959 when the Federal government ended its buying program. Mineral deposits were discovered in 1876 in the Florida Mountains district south of Spring Canyon in the main Florida Mountains. Hydrothermal fluids that created replacement deposits in carbonate rocks also formed these deposits. The hot fluids actually dissolved the limestone and dolomite in the carbonate rocks and left cavities that were later filled by precipitation of minerals from the fluids. From 1880 to 1956, 5,000 lbs copper, <10 oz gold, 8,000 oz silver, and >30,000 lbs lead worth approximately $102,000 were produced from carbonate-hosted Pb–Zn and polymetallic vein deposits in the district (McLemore et al., 1996). The Mahoney and Silver Cave mines were the largest metal producers. In addition, 200 short tons of fluorite and 1,421 long tons of 22–30% manganese have been produced from epithermal veins in the district (Farnham, 1961; McLemore et al., 1996). The basins around the Little Florida and Florida Mountains subsided as the mountains were uplifted. Rain and snow melt from the local mountains, including the Little Florida and Florida Mountains as well as the Cobre Mountains and Black Range north of Deming, percolated through the rocks, migrated into the basins, and formed large reservoirs of ground water that we call aquifers. Today, this ground water is being pumped from the basins surrounding Deming faster than it can be replaced by current rainfall. Gray perlite, thundereggs, geodes, jasper, onyx, agate, crystalline rhyolite, Apache tears (obsidian), and quartz crystals are among the more common rocks and minerals found in the park. Thompsonite, a zeolite, is found in amygdules in quartz latite (Northrop and LaBruzza, 1996). Agate is present in a wide range of colors and is one of the minerals that many visitors collect at Rockhound State Park. Some thundereggs and geodes found at Rockhound contain multicolored agate in addition to well-formed quartz crystals. The difference between geodes, thundereggs, and concretions can be confusing. “Geodes” are hollow or near-hollow, crystal-lined cavities found in igneous and sedimentary rocks. “Thundereggs,” also known as spherulites, are solid or near-solid nodules formed by magmatic and volcanic processes and are found only in volcanic rocks (Lofgren, 1971). Spherulites are made of radial crystals extending from the center. Prehistoric Indians found solid nodules near Mt. Jefferson and Mt. Hood in Oregon and thought that when the gods or spirits who inhabited the mountains became angry with one another they would hurl nodules at each other with accompanying thunder and lightning. Hence they called these nodules thundereggs (Shaub, 1979). They range in diameter from less than 1/4 inch to greater than a foot. “Concretions” are compact accumulations of minerals cemented together to form hard masses in sedimentary rocks. Concretions can be hollow inside, and some concretions contain a loose “nut.” Concretions can be any shape or size, whereas geodes and thundereggs are typically rounded to slightly ovoid. Many thundereggs found at Rockhound State Park are spherical and consist of two distinct parts: a dark-gray to pinkish outer part and a white, blue, or gray inner part, or core, which is recognizable as agate, chalcedony, and quartz crystals, all forms of the compound SiO2. In many examples, these two parts can be described as a shell and a filling. 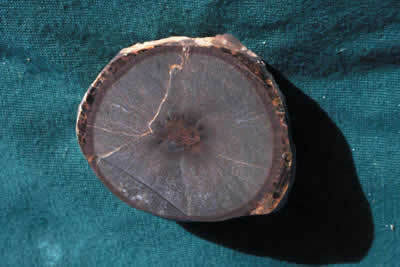 However, some thundereggs, or spherulites, do not contain the filling; they are composed of solid dark-gray to pinkish shell material (Fig. 3) or are partly hollow. Geologically distinct processes form the two parts of the thundereggs. The outer part of the thundereggs is formed by complex magmatic processes (i.e. as spherulites), and then the inner part is formed and modified by multiple cycles of late-stage hydrothermal fluids. The processes that form geodes and thundereggs are complex and are controlled by constantly changing physical and chemical conditions, such as temperature, pressure, depth of formation, composition of the magma, composition of the ground water, and composition of the host rocks. Figure 3 – Solid spherulite from Rockhound State Park (photo by Robert Colburn). In order to better understand the processes by which the thundereggs form, samples from Rockhound State Park were examined using a specialized microscope called an electron microprobe. The instrument used is a Cameca SX100 microprobe. It produces a beam of electrons that is focused onto a polished sample surface and then allows investigation of the distribution of chemical elements on the sample surface. The exact composition of minerals within a polished sample can also be determined by quantitatively analyzing characteristic electrons emitted from the sample. Microprobe examination of the "shell" portion of Rockhound spherulites (Fig. 3) shows that they are composed of intergrown crystals of quartz (SiO2), alkali feldspar (K,Na)[AlSi3O8], plagioclase feldspar Na[AlSi3O8]-Ca[Al2Si2O8], and magnetite (Fe3O4). 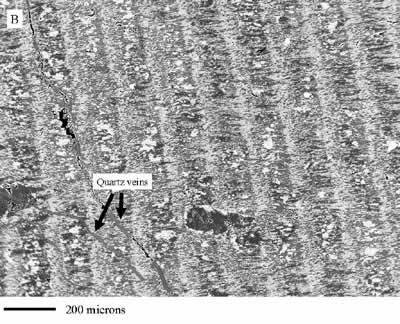 The images from the microprobe show that the spherulites are formed either of intimately intergrown quartz, feldspar, and magnetite or of bands of quartz systematically interspersed with bands of intergrown feldspar and quartz (Figs. 4a and 4b ). This banding produces the concentric structure that is apparent in some spherulites. Quartz veinlets crosscutting the banded structure are also observed (Fig. 4). Figure 4 – Backscattered electron images of polished samples of a Rockhound spherulite. A. Intimately intergrown quartz, feldspar, and magnetite. The darkest gray shade represents quartz, lighter gray represents feldspar, and the white represents magnetite. B. Banded intergrowth of dominantly feldspar (brighter bands) and dominantly quartz bands (darker bands). White areas are magnetite. Quartz veins crosscutting the banded crystallization can be seen. The observed patterns of crystal growth in the spherulites suggest that they may have formed during the cooling of the rhyolite lava. Similar spherulitic features were observed in an artificial melt that was rapidly cooled (Jacobs et al., 1992; Dunbar et al., 1995). The temperature of the artificial melt was monitored during the cooling process, and crystallization was observed at high temperatures (1,100°C). Spherulitic growth occurred during this crystallization process, and the internal structure of the artificially produced spherulites was very similar to the internal structure of Rockhound spherulites, although in the artificial melt the phenocryst phases were plagioclase and pyroxene rather than quartz and two feldspars. Furthermore, the feathery and non-equant shapes (Fig. 4) demonstrated by the crystals in the spherulites are very similar to some crystal forms described by Lofgren (1970, 1971) for crystals that grew rapidly at high temperatures. Investigation of spherulitic structures in a rhyolitic dike suggests that the spherulites grew at high temperature (Davis and McPhie, 1996), although another study of very small spherulites with simple internal structure (Akizuki, 1983) suggests that some may be able to form at lower temperature (~200°C). The complex internal structure and rapid-growth crystal morphology suggests that the shell portion of the Rockhound spherulites formed at high temperatures (~700°C), probably very soon after the rhyolitic lava was erupted onto the Earth's surface. Many spherulites found within the rhyolitic lava are hollow or partially hollow and/or contain a filling of banded agate, chalcedony, and quartz crystals surrounded by the dark-gray to pinkish outer shell. How do the spherulites become hollow? Although this is difficult to demonstrate directly, we speculate that the hollow centers of spherulites are formed by nucleation, coalescence, and expansion of vapor bubbles at high temperature, resulting in a hollow center that can be filled later by silica. The vapor bubbles would have formed as a result of crystallization of quartz, feldspar, and magnetite, which contain no water, from rhyolitic magma, which contains a small amount of dissolved water at atmospheric pressure (Taylor, 1986). Calculations of the volume of water vapor that could have formed from anhydrous crystallization suggest that the volume would be more than enough to generate the size of hollow cavities seen in spherulites. The reason that some spherulites are hollow and others are not may be related to the rate and depth of crystallization and to the resultant ability or inability of vapor bubbles to nucleate and coalesce. The agate, chalcedony, and quartz veins and open-space-fillings within voids in the spherulites formed later by multiple cycles of hydrothermal fluids. Hydrothermal fluids are a mixture of late-stage fluids escaping the magma and local ground water. The fluids contain some elements from the original magma and also dissolved minerals from the country rock. The amount of ions that the fluid can dissolve depends upon pH, temperature, pressure, and composition of the fluid. The hydrothermal fluids move through fractures in the rocks, which crosscut the igneous textures, and form veins or banded agate, chalcedony, and quartz. Some of these fluids seep through microscopic pores and into spherulites and gas pockets in the volcanic rocks, and they precipitate crystals along the walls of the cavity, forming geodes and geode-like spherulites. Other fluids seep through fractures and gas and other void spaces in the spherulites. Because of their formation by multiple hydrothermal events, each thunderegg provides clues as to its unique formation. Different temperatures and fluid compositions would account for the variety of textures found within any given thunderegg or geode. By carefully studying the crystal fill and textures in spherulites and geodes, geologists can piece together the different processes through time that formed them. The banding found within some spherulites and geodes consists of multiple layers of different colored agate, chalcedony, and locally quartz, and may have been formed by fluids supersaturated in silica (Fournier, 1985a). Supersaturated solutions are solutions that contain excessive silica in solution. The presence of silica minerals within the thundereggs and geodes indicates that the fluids were saturated in silica. Saturated fluids are fluids that contain enough silica in solution without precipitating silica minerals. When a silica-saturated solution cools slowly, crystalline quartz is deposited at approximately 200°–340° C (Fournier, 1985a). Rapid cooling of a silica-saturated fluid allows supersaturated solutions to form that precipitate chalcedony or amorphous silica. These supersaturated fluids are unstable and quickly deposit thin layers of chalcedony or amorphous silica, typically at lower temperatures (<200° C). The fluid loses silica due to precipitation and becomes saturated with silica but as the fluid continues to cool rapidly, it becomes supersaturated with silica again. An increase in salinity (such as NaCl) increases the solubility of silica at higher temperatures and also produces saturated silica solutions (Fournier, 1985a). Super­saturation of the fluids can also occur by mixing of different hydrothermal fluids, especially with different pHs, and by reaction of hydrothermal fluids with volcanic gases. The different colors of the bands are a result of trace amounts of impurities, such as iron (red), manganese (black, pink), cobalt (blue, violet-red), copper (green, blue), chromium (orange-red), nickel (green), etc. Faceted quartz crystals indicate that the fluids were somewhat supersaturated with silica and that precipitation occurred under relatively slow-changing conditions (Fournier, 1985a). Not all geodes are spherulites formed by magmatic processes; other natural processes form some geodes. Lower-temperature ground water percolates through the cooled volcanic rocks and dissolves additional minerals. These fluids are typically low temperature (<200° C), although locally higher-temperature (200°– 300° C) ground waters may be present, especially adjacent to the volcanic vents. These fluids move through microscopic pores in the rock by a process called “diffusion.” During diffusion, some ions in the fluid collect into void spaces and gas pockets in the rock, whereas other ions cannot pass through. This collection of ions surrounding these void spaces may actually, in some cases, form the hard outer shell that is characteristic of geodes. The outer shell may be strengthened by the precipitation of some ions that were excluded during crystallization of agate, chalcedony, and quartz and concentrated in the remaining fluid. Fluids also enter the void spaces through fractures. The void spaces may have originally formed by gas pockets within the magma or by prior dissolution of spherulites or other features within the volcanic rock. Figure 5 – Schematic cross section of formation of tiltage spherulite (modified from Colburn, 1999). The presence of calcite in some thundereggs and geodes indicates another episode of physical and chemical conditions (Fournier, 1985b). Calcite typically cannot crystallize from a silicic magma; therefore, the calcite must form from hydrothermal fluids. In most waters, heating of the fluids causes calcite to precipitate, and cooling of the fluids without boiling will cause calcite to dissolve. Calcite can also precipitate when a fluid quickly loses pressure and boils immediately (i.e. flashes) as a result of loss of CO2 (Fournier, 1985b). Geologists must carefully examine the textures, determine the concentrations of the fluids, calculate the pressures and temperatures, and decide which process occurred in a specific thunderegg or geode. Tiltage thundereggs, locally found at Rockhound State Park, are filled with horizontal layers of agate and chalcedony that are overlain by concentric-banded agate and chalcedony; the contact between the layered and banded agate resembles an angular unconformity (Fig. 5). These thundereggs record either small local landslides or tilting of local fault blocks within the Little Florida Mountains while the crystals were precipitating from the fluid (Fig. 6; Shaub, 1979; Colburn, 1999). Figure 6 – Tiltage spherulite (photo by Robert Colburn). Other events can modify or even destroy thundereggs and geodes. As the spherulite forms, the expanding magmatic vapor can rupture and break the spherulite, forming fractures that may later fill with agate, chalcedony, or quartz and form vein-like features instead of thundereggs (Colburn, 1999). Similar vein-like features occur if the geode was fractured or broken before the hydrothermal fluids precipitated. Localized fracturing or faulting of thundereggs and geodes can occur during crystallization, and the fractures can be cemented together by other hydrothermal fluids. Later-stage ground waters can dissolve portions of the thunder­eggs and geodes instead of precipitating minerals. 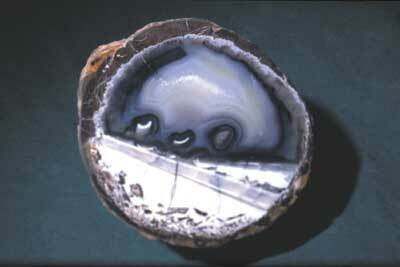 Thundereggs and geodes cannot be distinguished from one another until they have been broken apart. The beauty of a thunderegg or geode is locked inside the hard, rough-textured outer shell. All it takes to look for thundereggs and geodes is a rock hammer, pick, shovel, brush, chisel, collecting bag or pack, and persistence and patience. For more information on how to orient, where to collect, and how to slab thundereggs, see Colburn (1999). Akizuki, M., 1983, An electron microscopic study of anorthoclase spherulites: Lithos, v. 16, no. 4, pp. 249–254. Clemons, R. E., 1982, Geology of Florida Gap quadrangle, Luna County, New Mexico: New Mexico Bureau of Mines and Mineral Resources, Geologic Map 52, scale 1:24,000. Clemons, R. E., 1984, Geology of Capitol Dome quadrangle, Luna County, New Mexico: New Mexico Bureau of Mines and Mineral Resources, Geologic Map 56, scale 1:24,000. Clemons, R. E., 1998, Geology of the Florida Mountains, southwestern New Mexico: New Mexico Bureau of Mines and Mineral Resources, Memoir 43, 112 pp. Clemons, R. E., and Brown, G. A., 1983, Geology of Gym Peak quadrangle, Luna County, New Mexico: New Mexico Bureau of Mines and Mineral Resources, Geologic Map 58, scale 1:24,000. Clemons, R. E., Christiansen, P. W., and James, H. L., 1980, Southwestern New Mexico: New Mexico Bureau of Mines and Mineral Resources, Scenic Trips to the Geologic Past, no. 10, 119 pp. Colburn, R., 1999, The formation of thundereggs (lithophysae): Robert Colburn, CD-ROM, 385 pp. 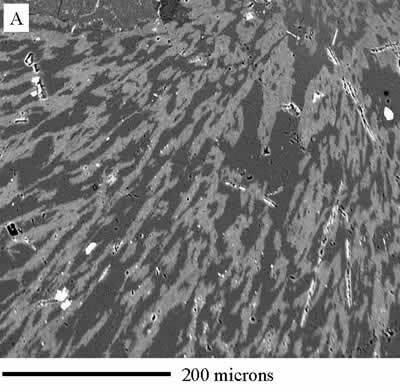 Davis, B. K., and McPhee, J., 1996, Spherulites quench fractures and relict perlite in a Late Devonian rhyolite dike, Queensland, Australia: Journal of Volcanology and Geothermal Research, v. 71, pp. 1–11. Dunbar, N. W., Jacobs, G. K., and Naney, M. T., 1995, Crystallization processes in an artificial magma: Variations in crystal shape, growth rate, and composition with melt cooling history: Contributions to Mineralogy and Petrology, v. 120, pp. 412–425. Farnham, L. L., 1961, Manganese deposits of New Mexico: U.S. Bureau of Mines, Information Circular 8030, 176 pp. Fournier, R. O., 1985a, The behavior of silver in hydrothermal solutions; in Berger, B. R., and Bethke, P. M. (eds. ), Geology and geochemistry of epithermal systems: Reviews in Economic Geology, v. 2, pp. 45–62. Fournier, R. O., 1985b, Carbonate transport and deposition in the epithermal environment; in Berger, B. R., and Bethke, P. M. (eds. ), Geology and geochemistry of epithermal systems: Reviews in Economic Geology, v. 2, pp. 63–72. Jacobs, G. K., Dunbar, N. W., Naney, M. T., and Williams, R. T., 1992, In-situ vitrification: Observations of petrological processes in a man-made magmatic system: EOS, Transactions of the American Geophysical Union, v. 73, pp. 401–411. Kiely, J. M., and James, W. C., 1988, Diagenesis of the fanglomerate of Little Florida Mountains (Miocene), southwestern New Mexico; in Mack, G. H., Lawton, T. F., and Lucas, S. G. (eds. ), Cretaceous and Laramide tectonic evolution of southwestern New Mexico: New Mexico Geological Society, Guidebook 39, pp. 175–184. Lasky, S. G., 1940, Manganese deposits in the Little Florida Mountains, Luna County, New Mexico; a preliminary report: U.S. Geological Survey, Bulletin 922-C, pp. 55–73. Lofgren, G., 1970, Experimental devitrification rate of rhyolitic glass: Geological Society of America, Bulletin, v. 81, pp. 553–560. Lofgren, G., 1971, Spherulitic textures in glassy and crystalline rocks: Journal of Geophysical Research, v. 76, no. 23, pp. 5635–5648. McAnulty, W. N., 1978, Fluorspar in New Mexico: New Mexico Bureau of Mines and Mineral Resources, Memoir 34, 64 pp. McLemore, V. T., 1996, Copper in New Mexico: New Mexico Geology, v. 18, pp. 25–36. McLemore, V. T., Sutphin, D. M., Hack, D. R., and Pease, T. C., 1996, Mining history and mineral resources of the Mimbres Resource Area, Doña Ana, Luna, Hidalgo, and Grant Counties, New Mexico: New Mexico Bureau of Mines and Mineral Resources, Open-file Report 424, 252 pp. Northrop, S. A., and LaBruzza, F. A., 1996, Minerals of New Mexico: University of New Mexico Press, Albuquerque, New Mexico, 356 pp. Shaub, B. M., 1979, Genesis of thundereggs, geodes, and agates of igneous origin: Lapidary Journal, v. 32, pp. 2340–2354, 2548–2566. Taylor, B. E., 1986, Magmatic volatiles: isotopic variation of C, H, and S; in Valley, J. W., Taylor, H. P., and O'Neil, J. R. (eds. ), Stable isotopes in high temperature geological processes; Reviews in mineralogy: Chelsea, Michigan, Mineralogical Society of America, pp. 185–225. Weber, R. H., 1980, Rockhound: New Mexico Geology, v. 2, pp. 59–60.